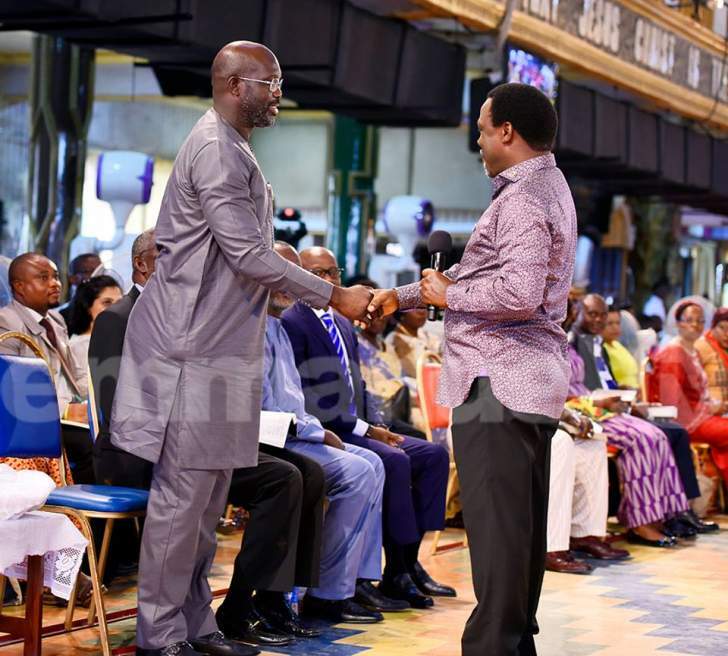 On Sunday, October 22, 2017, the leading presidential candidate in Liberia and footballing legend George Weah attended a Church service in Lagos, Nigeria to "seek God's face" for his nation. The famous Liberian Senator was part of a multi-cultural congregation at The Synagogue, Church Of All Nations (SCOAN), led by Pastor T.B. Joshua. 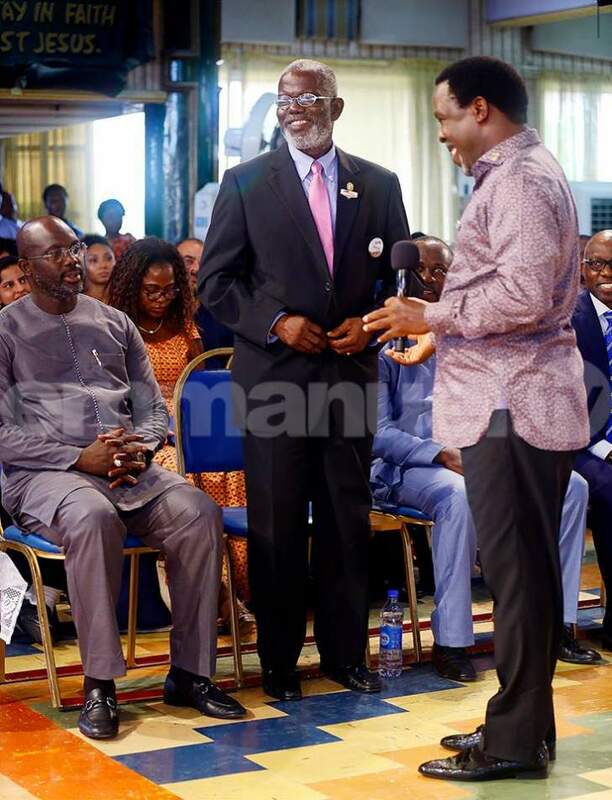 During his sermon which was broadcast live on popular Christian channel Emmanuel TV, Joshua warmly welcomed Weah and spoke directly to him. "My brother is here today because he loves his country and wants God's choice for his country," Joshua stated. "He is not here to impose himself. What does God say about his country, Liberia? What is God's opinion? That is why he is here." The cleric went further to reiterate that he was not favoring any particular side of the political spectrum but his own role was to pray for "the will of God" to be done in the nation of Liberia. "We are not herbalists or witch-doctors; we are people of God. God's choice is our choice. We cannot pray against God's will," Joshua stressed, with Weah nodding firmly in agreement. "Without God's corresponding power, we cannot pray to Him. For every step we take – every movement and action – intimation comes first," Joshua further expounded. "There must be suggestion from the Spirit to move before we move. If truly I am a man of God, I must hear from God – move or don't move." Joshua, who is known for political neutrality, noted that Liberia's incumbent Vice President and Weah's contender in the upcoming presidential run-off, Joseph Boakai had also contacted him to request a meeting. "God's opinion is what we should seek in our country – simple! God is the Answer, the Final," the influential Nigerian pastor added. Also present in the service was Senator Yormie Johnson, a former Liberian war lord and also one of the nation's prominent presidential candidates. Joshua was instrumental in Johnson's conversion to Christianity and mediated his reconciliation with the family of the late Liberian President, Samuel Doe. "You cannot twist or bribe God; He is not a man… The best place to go is to meet people God has given the grace to be a communicator between visible and invisible," Joshua concluded. "Meet them and let them tell you what is the way out – the next thing to do." The presidential run-off elections between Weah and Boakai is scheduled to hold on November 7, 2017. 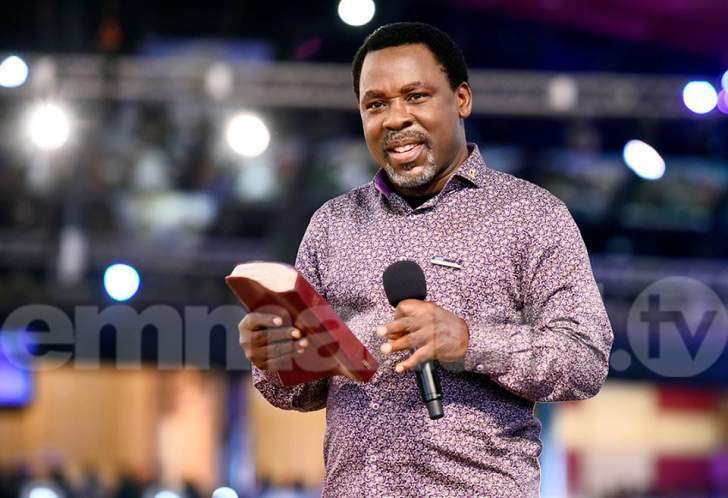 Other prominent visitors to The SCOAN in the past have included Tanzania's President, John Magufuli, the late President of Ghana, John Atta Mills, Zimbabwean Prime Minister Morgan Tsvangarai and Julius Malema, South Africa's fiery opposition leader.